Why argue with success? Especially when the road appears to point straight ahead to even greater success. That's about how Ford figured it when this kingpin carmaker (with five of the top-ten best-selling vehicles in the country) decided to badge its sport utility with the Mercury logo. 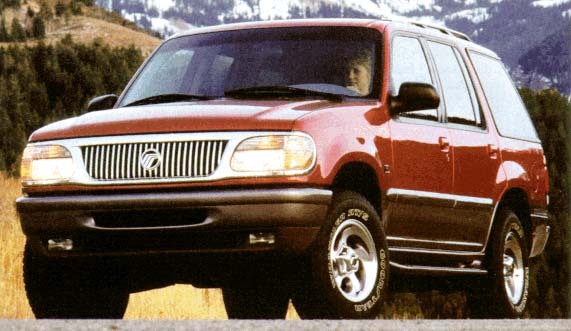 Lincoln-Mercury took note of the fact that nearly 35,000 brand-loyal customers defected to buy an SUV in 1994. As a result, the Mercury Mountaineer, rolling off the assembly line this spring, was born. Everyone knows that sport utility vehicles are hot. In fact, Explorer's sales have doubled since it was introduced in 1990. It was the third best-selling vehicle in America last year and the best-selling sport utility for the past five years. But the new Mountaineer is not just a rebadged Explorer with a few accoutrements thrown in for good measure. It's a new engine, a new transfer case, changes to the front suspension and the rear axle along with a few luxury touches that Mercury thinks will fit the personality of some 25,000 to 35,000 buyers this year. With their first entry into the SUV market, Mercury hopes to attract more women and families who are looking for the standard safety features of anti-lock brakes, dual airbags and all-wheel drive in addition to a host of important attributes. After all, the Explorer's main redesign for the 1995 model year brought significant changes to appearance, performance and handling. Competitors for this upscale entry include Chrysler's Jeep Grand Cherokee, Land Rover's Discovery, Toyota's 4Runner, Nissan's Pathfinder, Mitsubishi's Montero and the new Acura SLX. The Mountaineer's front end is distinguished by the bold, aggressive Mercury grille with wrap-around headlamps and the integrated fog lamps below. Other exterior styling cues that distinguish the Mountaineer from the Explorer are running boards, color-keyed bodyside moldings with Mercury badging, a unique rear bumper, and an integrated roof rack. Last year's exterior redo gave it smoother, softer lines that carry over to the inside. One of the only complaints that Ford heard about the popular Explorer was that it was underpowered. The V6 was found lacking by some in steep terrain, higher elevations and towing capacity. The answer is a new powertrain that benefits from a hybrid truck engine with the new 4.6-liter Mustang parts. And, while designers realized that Explorer's Control Trac four-wheel drive system worked well, they also noted the success of the Aerostar's all-wheel drive system. The result is a powerful V8 engine matched to a four-speed automatic transmission with full-time all-wheel drive. You'll get 210 horsepower at 4600 rpm and 275 foot pounds of torque at 3200 rpm with a compression ratio of 8:8:1. The Mountaineer's all-wheel drive system sends 65 percent of the engine power to the rear axle to provide drive power and 35 percent of the power to the front axle for traction. Torque is distributed to either axle when more traction is needed through a viscous coupling in the transfer case. Also new under the hood are stainless steel exhaust headers; high-tech ceramic exhaust manifold shielding; high performance cylinder heads and platinum-tipped spark plugs that stretch tune up intervals to 100,000 miles with regular fluid and filter changes. Inside the cabin, you'll find the Mountaineer logo embossed in the premium cloth captain chairs or six-way power sport bucket seats or leather buckets that come standard. There is more than 81 feet of passenger and cargo room and an optional premium floor or overhead console for extra stowage that contains ashtray, coin holder, cassette/CD storage, and dual cupholders, a message center and a tissue box holder. Standard luxuries include a leather wrapped steering wheel and a power equipment group that provides power windows and door locks, one-touch-down feature for the driver's window and dual power mirrors. We found the Mountaineer's inner sanctum attractive and convenient with pleasing ergonomics for our testers. The wrap-around instrument panel, which includes electronic temperature control and easy-to-manipulate knobs, is driver-oriented. Options include a premium sound system with six-disc CD changer, a voice-activated cellular phone, a power moon roof, keyless entry and an anti-theft package. Safety features are numerous and include standard dual airbags, 4-wheel disc anti-lock brakes, rack and pinion steering, five-position adjustable height shoulder belts, rear seat headrests in the outboard positions, high-mounted stop light, fog lamps and rear reflectors, composite cross car beam, speed-sensitive windshield wipers, and illuminated controls and entry. An integrated rear child seat is also available. Being very familiar with Explorer's performance, our testers were very pleased with the dramatic difference in throttle response when driving the Mountaineer. The V8 showed quick, available power that is modulated well across the power band. It was particularly noticeable when passing and on uphill grades. Rack and pinion steering was precise and brakes which were tweaked to handle the V8's increased weight were strong. Weight has not affected fuel economy, which remains the same at 14 mpg city and 18 mpg highway. The double-wishbone front suspension (Short and Long Arm) delivers a comfortable ride with little bounce and body roll. Suspension upgrades for the Mountaineer's front end include increased spring weights and an anti-rotation system to rear axle to control pinion windup. A limited slip differential and an anti-rotation system that restricts axle rotation during high-torque applications also improves the ride and handling. Testers found the all-wheel drive seamless in operation and effective on slick and loose surfaces. You'll enjoy the bumped up towing capacity, which increased from 5,000 to 6,500 lbs. Mountaineer's tires, P235/15 all-terrain's, match the personality of the vehicle with good on-road performance and moderate off-road capability. The Mercury division of Ford has a reputation for building quality vehicles. They've decided to stake a claim over customers who defected because until now they had nothing to offer in an SUV. The Mountaineer gives them a good opportunity and adds another alternative to this sales-crazed field of sport utilities. So, in the end, it's an Explorer. But it's also more than a Mercury logo stuck on the front and on the seats. There's the practicality of all-wheel drive for customers who want to feel secure and comfortable with the benefit of powering their vehicle with all four wheels. And there's a V8 for strong passing and pulling power. It's worth a look.